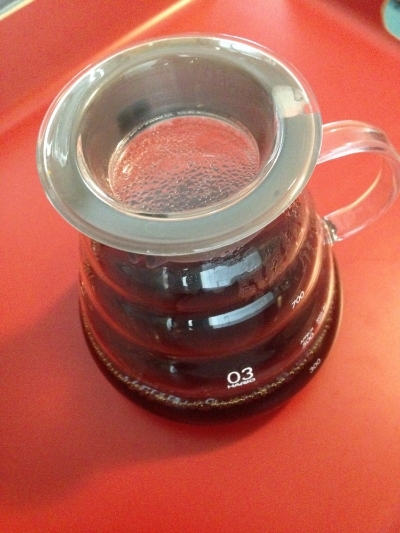 Thank you for sending the Hario coffee pitcher. It arrived very quickly, considering that you sent it all the way from Japan. I have been using it every day- it's much better than the jar I had been using for my coffee, and I think my wife likes it because it looks much prettier in the kitchen. Since I never put it away, that's very important. Thank you also for including the paper coffee filters with my order- that was very kind of you. Although they are not exactly the kind of filter I use, I will make it work. I hate for things to go to waste, especially nice gifts like that. 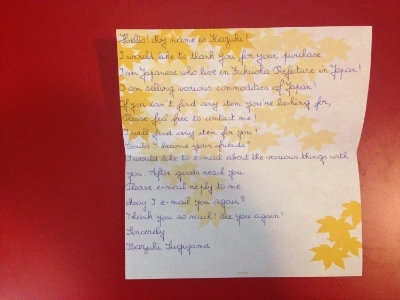 Your English is very good, and your penmanship is superb; much better than mine (the handwriting, at least. Rest assured, though, your English blows my Japanese away.). My handwriting is terrible, so when I write to my friends, I use a typewriter, which makes my writing worse and worse, since I don't practice anymore. It's what we call a "vicious cycle". You skills with a foreign language certainly merit the vim with which your business card tells the world: I can Speak English! I hope you don't mind if I give you a little piece of advice regarding your English. You are very liberal in your use of the exclamation point. This is a very effective tool in writing English, but it is much more effective when you use it less. It is meant to express urgency and loudness, or extreme emotion in a statement. For example, if you write "Don't park your bicycle there." It implies that you are telling the person in a calm voice where she should not park her bicycle. However, if you write "Don't park your bicycle there! ", it sounds as if you about to storm down there and smash the bicycle with a baseball bat. Of course there is a place for this, but it is not as often as many people think. In your letter, you don't need to use it when telling me your name and the name of the prefecture where you live. But when you tell me I will find any item for you!- Now that's a bold statement that is worthy of an exclamation point! I was very touched that you took the time to seal an envelope with individual stickers that spelled out my name- that was a personal touch that I have learned not to expect from an online purchase- they are usually so impersonal. But my transaction with you has been the opposite. 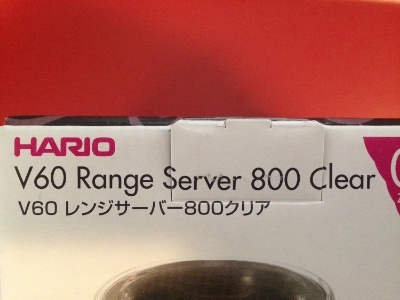 I don't feel like I received an 800ml Hario coffee server from a cold and cavernous warehouse- I feel like I got it from a person. A person who packed the box very carefully. A person who enjoys whimsical stick-on letters and quality stationery. A person who loves Star Wars, judging by the picture of that person (presumably) with life-sized figures of R2-D2 and C-3PO. Wait- there's a storm trooper in that picture, too. That film came out just about six weeks before I was born. To answer just a few of your questions: Yes, we can email about the various things. Yes, you may email me again. It's good to know that you will find any item for me. Can you get me a toe? Ha. Do you know what movie that's from? Yes, I will feel free to contact you. As for the question of whether you could become my friends: I don't know. The immediate answer I want to give is yes- yes, you can be my friend. But what would that really mean to you? I can see that you're eager to accumulate friends in the U.S.; you are very proud of your English and you seem eager to please. And to be honest, I did feel a little bit special when I saw the personal touches you put into my order. And I felt a little bit special that you want to be my friend. Look- by all indications, you are a very nice guy. One of those indications is your feedback on Amazon, which is overwhelmingly positive. Some Americans have complained about shipping being slow, but what do they expect when they're paying $6.99 to get something shipped from Japan?! Geez! And I don't believe that Betty Fink for one minute when she says "Seller was very rude!!!!!" That certainly does not sound like it could be you. Maybe she misunderstands your imperfect (but still very good) English as brusqueness, which means curtness, which can also be construed as rudeness. Maybe it's your exclamation points, but it looks like she has an exclamation issue of her own. Your sweetness shows through in much of the positive feedback- which is hard to do. In fact, a lot of the comments on your page indicate that you sent whimsical gifts, personalized stationery- even photos of yourself (the same one!) to other buyers. There's nothing wrong with this, but I can't help but wonder: Are you asking all of these people to be your friends, too? Be honest. There's nothing wrong with that, I suppose, but what kind of friendship do you expect to have with dozens of people about whom you know little more than their usernames? How do you know you'd want to be friends with them, and how do they know they'd want to be friends with you? And how do you know you want to be friends with me? Yes, you know from my Hario purchase that I enjoy quality coffee-brewing equipment- but that's all. I certainly won't rule out being friends with you, but don't we want to base it on something more? It seems like in my life, I have not really set out to be friends with anyone; it always just happens. One day I was working alongside, or buying wine from, or sitting in a classroom next to, or lending a guitar to a total stranger. The next thing you know, we've been friends for years, and I can't imagine my life without them. Shared interests, shared struggles, similar (or opposing yet stimulating) points-of-view- aren't these are the things that make friendships? Think about your friends in Japan; not the ones you sell items to, but the ones you meet out for tea and the ones you laugh with. Why are you friends with them, and how long did it take? It seems to me that friendship- like quality coffee beans and the gear used to magically transform them into an invigorating brew- should be rich, should be comforting and rewarding, and should never be cheap. So let's keep in touch. We can email about the various things. I will certainly let you know if you can find anything for me, and you can let me know whether I can find anything for you. And we'll see where it goes from there.